Anytime, anywhere banking on your schedule is easy as texting. Now your bank is always open! You're already skipping the trip to the branch with mobile deposit, so why are you still writing checks to your friends and family? P2P payments let you transfer funds electronically from your account to someone else's account in minutes, even if it's at another bank. Start using this reliable, secure service today! 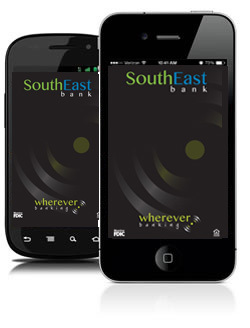 Skip the bulky login and just use your fingerprint the next time you sign in to the SouthEast Bank mobile app from an eligible device. It's fast, simple, and best of all, doesn't require any special characters. Sync your Apple Watch with your iPhone to get account balances and recent transactions without having to log into your mobile banking app. LEARN MORE.